Norma Loudenslayer of Citrus Heights, CA posted this letter to the editor in the Sacramento Bee. After Pearl Harbor, we too lost something, we lost our identity along with our dignity and honor. My ancestors, too, are buried, buried in Hiroshima. How long do we wait to get ourselves unstuck from blame and political discourse before we’re able to use our knowledge and experiences to create a nuclear free world of peace? We don’t need any apology or blame to help create this world.We owe this to our children. NYC is about good friends. And only a dear friend would wear this to dinner three nights later. 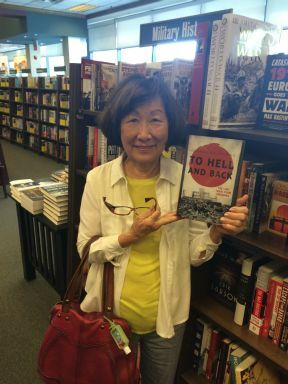 IF you have read Charlie’s most recent book: To Hell and Back: Last Train From Hiroshima, or his Titanic books, or my favorite science fiction Dust, among many others, you’ll have an idea how a cup of coffee can last three delightful hours and more. Thank you, Charlie. Now go write your autobiography. Yes, this is what writers do. 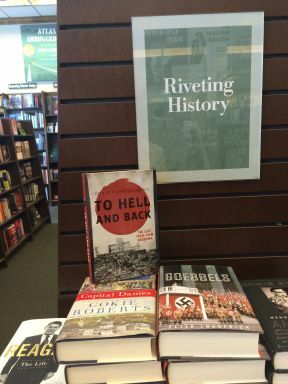 I went to Barnes & Noble to purchase another copy of To Hell and Back. There was only copy. I took it off the shelf and added it to a display. Better to leave sole copy for promo purposes than to buy out the only remaining copy. Hey Charlie Pellegrino, you owe me one.